No light in refrigerator? If your refrigerator is working properly overall. Such as the fridge is cooling in the fridge and is freezing in the freezer, but the light in fridge or freezer does not work. Usually this means the light bulb is bad. 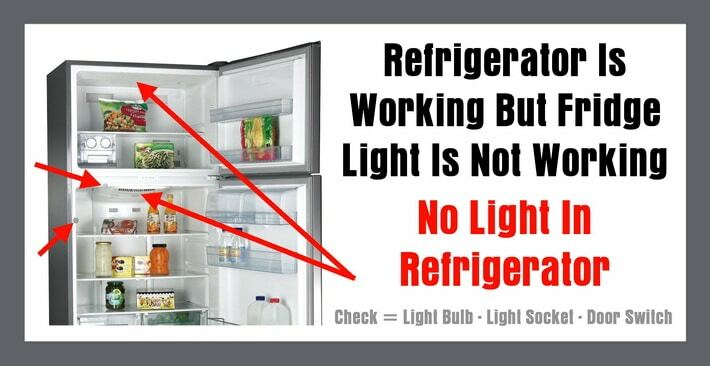 This may seem simple but many times it can be another problem and simply replacing the refrigerator light bulb will not fix the problem. Below we will show you the most likely issue to least likely issue so you can fix the light yourself and only have to troubleshoot the fridge if needed. If the light in your refrigerator is not working, obviously the first thing to do is remove the light and replace it with a new one. If you do not have an extra light bulb for your fridge, simply check the bulb to see if it is bad by checking the filament. Shake the bulb lightly, do you hear the small pieces moving around? If so it is bad. Replace the bulb. 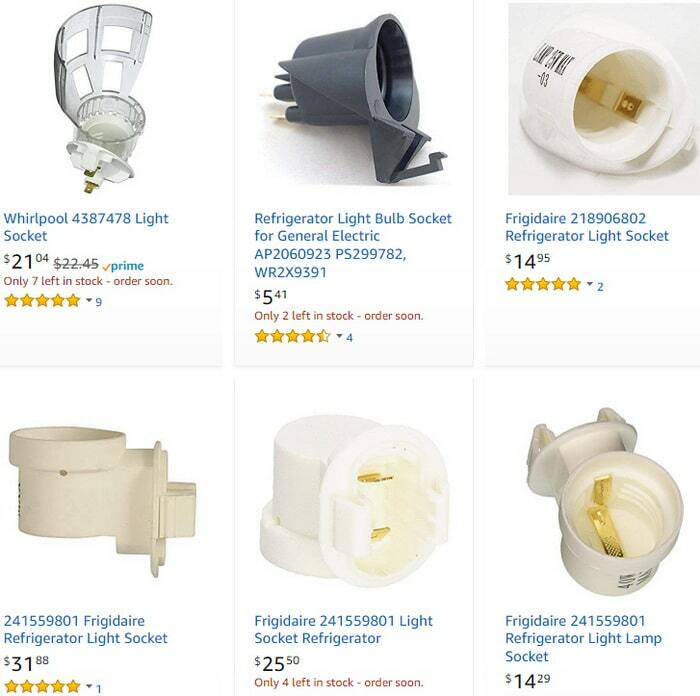 If replacing the light bulb does not bring light into the fridge, BE SURE THE LIGHT BULB IS GOOD… If so you either have a bad light bulb socket, a door switch issue, or a wiring issue somewhere in the refrigerator. Check the light bulb socket to be sure it is in working order. You can usually check visually by looking for any discolored or bent terminals, wires that are damaged, wires that are not connected, a cracked light socket, or a damaged light socket from heat over time. These issues can make it so the connection from socket to bulb does not allow the bulb to illuminate. Remember to remove power before inspecting or checking a light socket in your refrigerator as it still has voltage going to it even if not working properly. A refrigerator door switch is what lets voltage go to the light bulb or bulbs in your fridge when you open the door. If after replacing the bulb you get no light, and the light socket checks to be in working order, you need to check the fridge door switch. 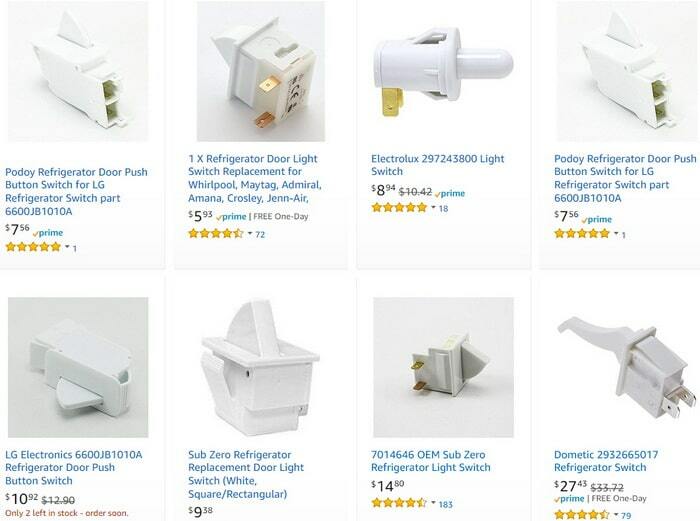 The bulbs and light sockets may be perfectly fine, but if the door switch is faulty, it will seem like the inside of the fridge is not working. Depending on the model of your refrigerator, the door switch will be located somewhere on the interior edge of the fridge. Carefully remove the door switch and check for continuity with a meter. This type of switch is a spring loaded switch and for electricians it is a “Normally Closed” type switch, meaning the switch should have no continuity when pressed in. If you have new light bulbs, working light sockets, and the fridge door switch is in working order, then you may have a wiring issue and further troubleshooting is needed. If you have gotten this far and you still have issues with “no fridge light”, please leave the model number of your refrigerator below and we will be happy to research the issue for you and give you some advise as to how to fix the problem. Hi I have a Kitchen aid fridge model # KFIS27CXMS1 . The fridge led light is not working. I have tested the switch with is good. No power coming to the led light plug . The fridge and freezer are working well , all the display is working good. I rest the fridge to factory setting too and the led light still didn’t come ON. Need help fixing this led light in fridge. The interior light bulb and socket need replacing. I live in India. Hitachi has shut down it’s refrigerator section and I’m unable to get the part.Can you please help by suggesting where and how I can get a replacement part? The fridge, freezer and door alarm are all working fine. Many thanks. Hi I have a fridge light problem, new bulb no joy, connector looks in tact not damaged, but I can’t find the door switch, please advise, fridge is Samsung RL41WGPS, thanks! Whirlpool GI5FSAXVY02. Checked bulb, socket and door switch. None of the inside lights are working and they went Out at different times … any suggestions are appreciated ! All LED lights on the inside are out. Has multiple door switches. Door chime no longer works and Water does not discharge. Had a red notice light that looked like door was open that had an “x” on it as well. Other lights/options in door are on. Fridge seems to be cooling properly. Kenmore 795.76203.901. 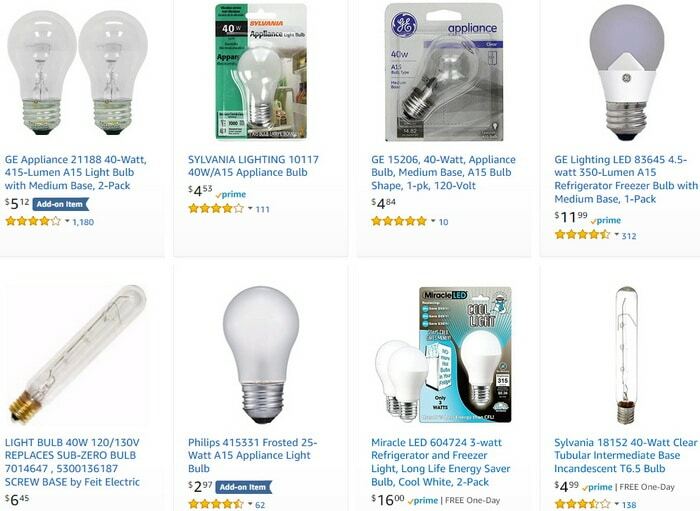 Frig and freezer lights quit at the same time … bulbs ok. Seems odd both would go out at the same time. Cooling and freezing normally. I’ve replaced the frig door switch about a year ago. Frig is 5 yrs old. Older Sears/Kenmore fridge/freezer #61521. Bulb, socket and switch are in order with no light. Any hope for this old girl? No info found so far through Google. I have a a Frigidaire side by side refrigerator with a faulty fridge side light switch. I can find the switch in the freezer but not in the refrigerator! Frigidaire can’t even help me. The model is FSC23LR5JM1. Can you help me?? Hi – You cannot find the location of the switch in the Frigidaire side by side refrigerator or you need the part number to replace it? light not working in frigidaire refrigerator model number FRT8HIS6FWO. Checked the socket , it’s fine and still not working. Switch also looks good. I’ve replaced the bulb and the light socket and neither option has worked. Every other function is working fine except the fridge light. Haven’t tested the socket for power because I don’t have the tools. The switch also seems to be working fine. Any advice would be great. GFE28GMKBES 18 month old GE. dropped a jar on the inside and it jolted the LED lights dark. Spoke with a technician and he thought it was a transformer issue? I have a 20 year old Amana Top Freezer Refridgerator. Model # TH21VL The light in both the fridge and freezer stopped working at the same time. Everything else seems to be operating properly. The bulbs look fine. Both lights and temperature indicators not working. Checked door switch and it’s fine. Seems like no power to switch. Our Regridgerator Model is LG LFX25950SB and top inside lights are not working. 1. It has two bulbs and I removed the bulb and tested them. They have same house bulb thread and they work fine in home. 2. I understand that switches are also good as it has two switchs ( one in both doors) and when doors are left open for a long time fridge starts beeping. This function is working fine, which tells me switches are working fine. 3. I have also tested the socket with a multimeter and they have connectivity on both wires. Which could be wrong in this case? Refrigerator Tfx20r. Checked bulb, socket and door switch all those are good. What next? Is there a ground somewhere I’m missing?